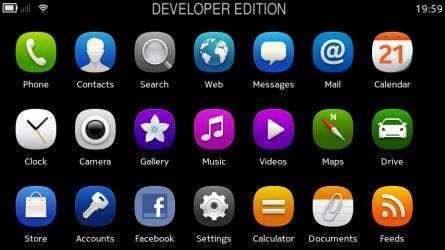 MeeGo-Harmattan N9 Homescreen in landscape – N9 to get years of support and several software updates. From the early N9 demoes and screenshots, one thing we’ve noticed is the lack of landscape orientation. Everything seems stuck in portrait. 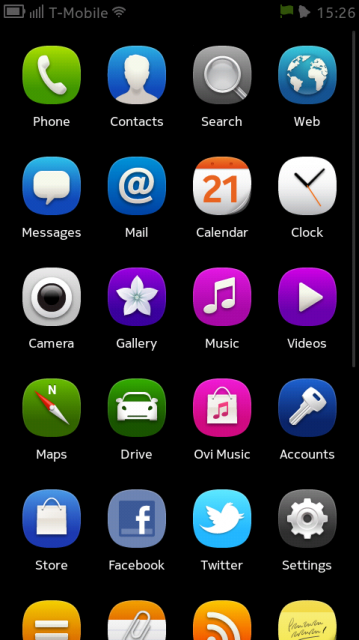 That’s ok as the main aim of the N9 MeeGo-Harmattan was one handed use. Adnan found some screenshots from MeeGo forum of the homescreen in landscape. This would come particularly useful for those Devs and their landscape slide out keyboard N950, but eventually for users of N9 too. Yum. 7×3,21 icons (in landscape view, 24 in portrait) versus the measly 12 in Symbian (either way due to much wasted space. improved slightly in S^3). Some might find this a little overwhelming but I like it. (Your memory will/should pick up over time where everything is positioned – if not, just move things where you want). Screen size not so much issue, 3.5″ Maemo 5 N900 could also fit possibly 20 icons per page. iPhone is another example. BTW, does iPhone do landscape menu? Normal portrait view: I don’t know if any icons have been moved btw as they’re from different devices. 4×6. 24 apps in portrait view. Well, almost. Possibly just 20 as you don’t see the bottom ones fully. Finally, a tweet from @klasstrom at Nokia – Nokia N9 will be getting support for YEARS and will get SEVERAL software updates. Cheers for the tips Adnan!